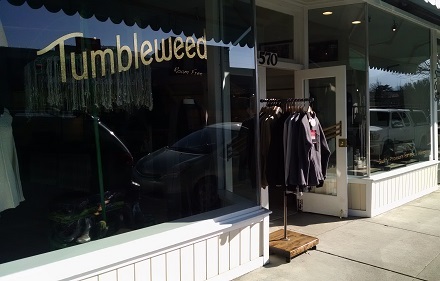 Tumbleweed Roam Free, the innovative and fun, family-owned and run boutique that we featured back in June has continued to flourish and evolve. The shop recently moved to 570 San Anselmo Avenue, former site of Beach Bella, and just up the street from the original location. Owner, Kacey Gardner says that the space works much better for their needs. Kacey, along with her husband Tim, daughter Sophie, and sons Duncan and Quinn have worked tirelessly, with love and creativity, and the results speak for themselves! They offer a constantly-evolving selection of unique, interesting, high quality items for both women and men. They focus on local products but also travel to shows in LA, Las Vegas, or even New York to find just the right items for their eye-catching displays. Merchandise is ordered frequently in small batches, so the inventory is ever-evolving. If you're not familiar with this spot, take a look at our original blog post for details and then head on over for a personal visit; you're assured a warm welcome. And if you've already visited, but haven't seen the new store, you're in for a pleasant surprise next time you drop in.